A Math Goofy Glyph is a fun and potentially silly activity that your students can complete as a craftivity while honing their Common Core math skills. Math Goofy Glyphs are math glyphs that feature actions for when your students get their answers right… and different, goofy actions for when they get their answers wrong! 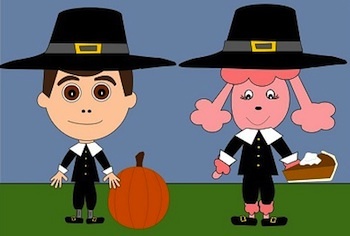 With the Thanksgiving Math Goofy Glyph, your students will answer a series of math questions about their own opinions and experiences about the Thanksgiving holiday in order to create a boy or girl pilgrim character. 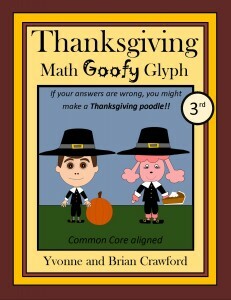 If your students get their initial answer wrong, they’ll create a Thanksgiving Poodle instead of a pilgrim. Subsequent questions and answers will dictate how your students should dress or decorate their pilgrim or poodle glyph. The more answers the students get wrong, the more potential there is for a silly outcome. The math problems on this glyph test addition, subtraction, multiplication or division skills of varying complexity depending on your students’ grade levels; the goal is for your kids to have fun while practicing their mathematics skills in an engaging and creative way. We’d love to hear any feedback that you have for our Goofy Glyphs or for any of our products aligned with the Common Core state standards for mathematics and literacy. If you try out any of our products in your classroom, please leave us a comment below and let us know what your students thought.